Female macroptera. Body brown to dark brown, tarsi and antennal segment III paler; fore wings light brown with base sharply paler. Antennae 8-segmented; segment I with paired dorso-apical setae; segments III–IV with apex forming short neck, sensorium forked; V with sensorium base circular, VI with sensorium base very broadly expanded. Head wider than long; 3 pairs of ocellar setae present; pair III anterior to hind ocelli, longer than side of ocellar triangle; postocular setae small, close to posterior margin of eyes. Pronotum with 1 pair of long posteroangular setae; posterior margin with 4 pairs of setae. Fore tibia with two recurved tubercles at apex, ventrally and laterally. Metanotum reticulate, campaniform sensilla present; median setae arise at anterior margin. Mesofurca with spinula. Fore wing first and second veins with complete row of setae; clavus with 5 veinal setae and one discal seta. Tergites without sculpture medially; VIII with group of irregular microtrichia anterior to spiracle, posteromarginal comb represented by a few microtrichia laterally. Sternites without discal setae, VII with median setae arising in front of margin. Male macroptera. Similar to female but smaller; mid tibia with small claw at apex; tergites with some sculpture lines medially, IX posterior margin with pair of conical spines on quadrate bases; sternites without pore plates, VI–VII with small lobe medially on posterior margin. Odontothripiella is an Australian genus that currently includes 18 described species, with several more undescribed species also known. 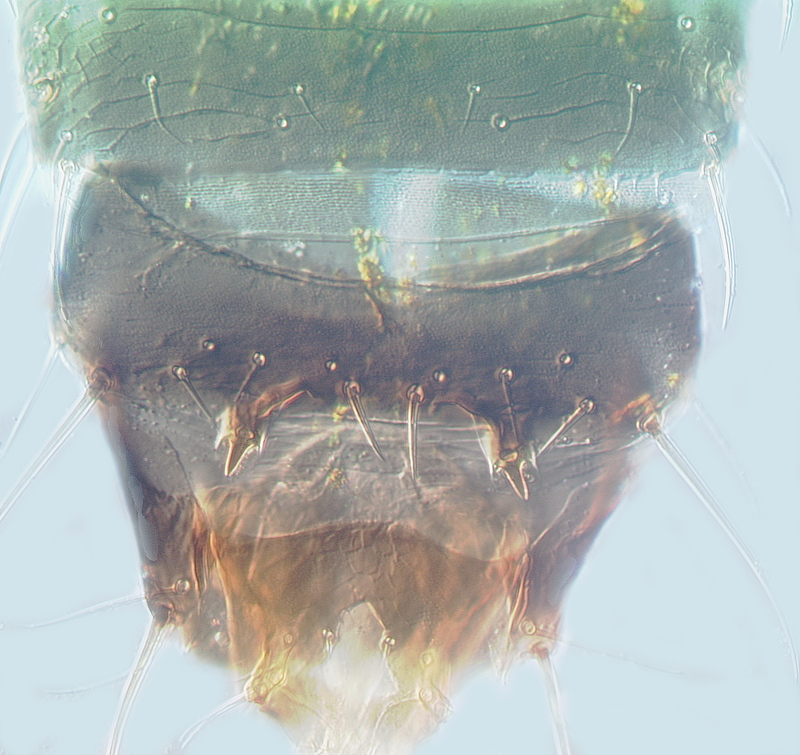 The genus shares many character states withMegalurothrips, in particular the presence of a pair of small setae dorsally at the apical margin of the first antennal segment. O. divaricata females cannot be distinguished from females of several other species in this genus including O. australis, but the males have a pair of short stout spines on the ninth tergite, and sternites VI–VII bear a small and translucent lobe on the posterior margin. Pitkin BR. 1972. A revision of the Australian genus Odontothripiella Bagnall, with descriptions of fourteen new species (Thysanoptera: Thripidae). Journal of the Australian Entomological Society 11: 265-289.